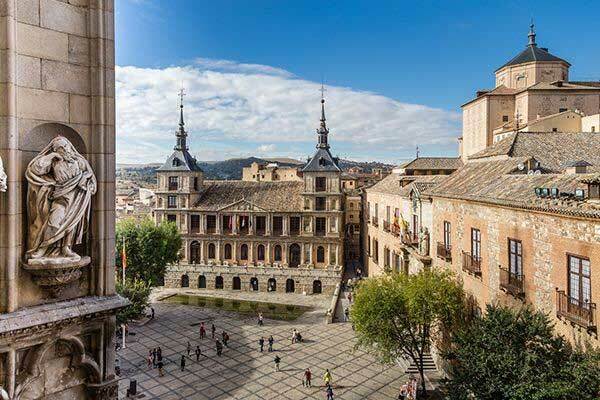 The city of Toledo, just an hour south of Madrid, is one of Spain’s biggest tourism destinations and has been a UNESCO World Heritage site since 1986. Thanks to its convenient location close to the capital and its cultural importance, Toledo attracts visitors pretty much all year round. But don’t be put off by the hordes. Some cities totally deserve their hype…and Toledo is one of them. This is a city drenched in history and drama. A day or two walking its steep, narrow streets gives you a better feel for Spain’s turbulent, checkered, and often tragic history than any number of history books. I don’t recommend living here: The city gets too many tourists for cozy living, and the climate is harsh (with blazing hot summers and cold winters). But definitely visit: You don’t really understand Castile—the heart of Spain—until you’ve been to Toledo. You may already know its skyline. El Greco’s iconic painting, View of Toledo—he lived over half his life here—is etched in our collective memory. And it’s no artist’s fancy, either: On a late-summer afternoon, I’ve seen a storm kick up in the hills behind Toledo and turn the sky into a mass of roiling dark clouds, just as El Greco painted it. Toledo impresses on several fronts. The first, of course, is the location. The city sits on a mountaintop, surrounded on three sides by the Tajo River. From a distance (or from the train station), it looms above the surrounding countryside. And once in Toledo, you find a city whose historic center—a maze of narrow lanes—remains much as it was in the Middle Ages. Walking through the back lanes of old Toledo is like walking through history. You can still find architectural remains of all three groups in Toledo today, as well as of inhabitants both earlier and later. This mix of cultures is a large part of Toledo’s appeal. 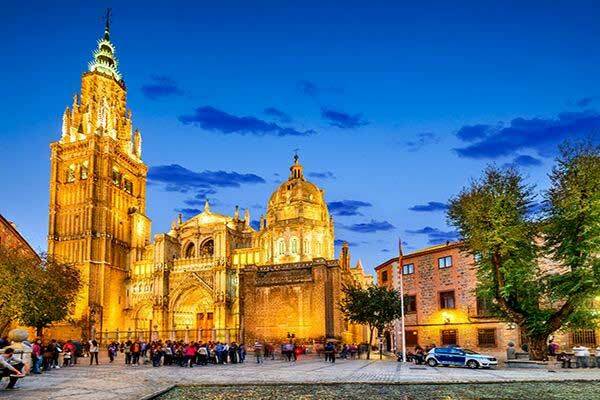 There’s enough to see in Toledo to keep you busy for a couple of days…especially if you take time out to enjoy a fortifying lunch or rest your feet as you sip a cold drink at a sidewalk café. But if time is limited, here are some of my favorite sights in Toledo, which make even a one-day excursion a living history lesson. The Alcántara Bridge has spanned the Tajo River since the Romans built it, providing access to the city. So walk across it yourself, as folks have been doing for nearly 2,000 years. There are Roman bridges, aqueducts, and buildings still standing (sometimes in out-of-the-way places) all over Spain—the Romans built things to last. The Alcántara Bridge has been restored many times over the centuries, so many bits are more modern (“modern” being relative; the latest bits are about 18th century). Still, it’s a nice way to connect with Toledo’s ancient roots…and the view looking up at the city is impressive. Or if you prefer, enter the city by the main gate, the Puerta de Bisagra Nueva, a triumphal arch with a tower on each side, which was built in the mid-16th century. Nearby is the Puerta de Bisagra Antigua, the old Bisagra Gate. It’s not as fancy as the new gate, but it’s considerably older—late 10th century—and was built while Toledo was still under Moorish rule. Santa María La Blanca, possibly Europe’s oldest intact synagogue building (now a museum), is a quiet little jewel. It was built in the 12th century, during the reign of a Christian king, and designed in the wannabe Moorish Mudéjar style (the horseshoe arches between its columns are very like those in mosques of the era). The building thus shows the artistic cross-pollination that once existed among the city’s religious groups. Its name, “Saint Mary the White,” is very descriptive: The interior actually is mostly white, lending the space a peaceful feel. It’s a nice, cool spot for soaking up a little ambience. Church of Santo Tomé. Though he wasn’t born here, El Greco is forever linked with Toledo. The artist painted one of his most famous works, The Burial of Count Orgaz, for Santo Tomé, his parish church. The little church, built over the ruins of an old mosque, is sweet. But most people—myself included—head straight to the back of the church to see the painting. In this small, quiet space, the burial scene—with its vivid golds in the foreground and its rows of Spanish grandees dressed in somber black behind—has an eerie power. If the painting piques your interest in El Greco, head over to the El Greco Museum, in the old Judería, or Jewish Quarter, to see more. The museum is housed in a 20th-century building, but a 16th-century building next to it recreates El Greco’s house. (The original was torn down centuries ago.) If you’ve ever wondered how they lived back then, this is your chance to see. For Christianity on a monumental scale, there is the cathedral, the Catedral Primada. Huge and rambling, the cathedral—built atop a mosque—is considered the best example of high Gothic architecture in Spain. You may want to unravel a ball of yarn behind you as you explore, just to be sure you find your way out. Though it’s not one of my favorites, it’s hard to miss the Alcázar, which sits on the highest point in the city, looming over it. The Alcázar began life as a Roman palace in the third century AD; was updated in Renaissance style in the 16th-century; saw Hernán Cortés received here by royalty after he conquered the Aztecs in Mexico; and was rebuilt in the mid-20th century after it was bombarded and largely destroyed during the Spanish Civil War. I’ve only looked at it from the outside, but there’s a sizable army museum inside, for those interested in war memorabilia. The art and architecture of this city can be not only mind-boggling, but mind-numbing. When you’ve hit your limit, take time for a break. And one of the best places to chill out is the busy Plaza de Zocodover, which for centuries was Toledo’s main square. Back in the day, it was the site of autos-da-fé, the burning of heretics condemned by the Inquisition. Today it’s a happier place, lined with shops and outdoor cafés, or terrazas. So kick back with a cold drink and people-watch. You’ve earned it.